Eliza and Dan had an amazing wedding at Arlington Hall! Check out their film 🙂 🙂 Congrats you two! Christin and Nick actually met by swiping right on Tinder, and we’re sure glad they did. These two had an instant connection and Nick knew pretty quickly that this girl is someone he should hold on to. After a few changes in Nick’s own journey, Nick made it official by asking for permission from Christin’s dad, Frank. Tragically, shortly after Nick secured Christin’s dad’s approval, Frank suddenly passed away. 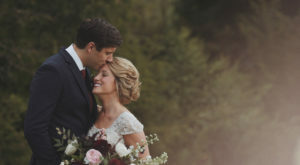 Christin and Nick and their families grew even closer during this emotional time and had amazing stories that incorporated Christin’s dad, including a red cardinal and Bible verse that spoke to Christin continually throughout the wedding planning. We loved all the intimate elements that honored Christin’s dad’s memory- they were a testament to the strength and love of this family. 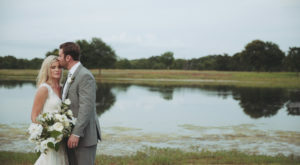 Christin’s attention to detail is one of the things that really shined on their wedding day. Both families and friends shared dinner in an intimate candle-lit tent on the lawn of one of the most romantic venues in Dallas, Arlington Hall. The long garland swags, gorgeous chandeliers, luxurious champagne colors, and five star meal from Food Glorious Food made their reception dinner exceptionally warm and memorable. Once dinner was done, the group moved inside to the gorgeous and spacious ballroom at Arlington Hall to continue the party long into the morning. In10city band kept everyone dancing on a packed dance floor. We couldn’t stop laughing at the fun as many guests, including our groom, removed their formal shirts and put on their party vests. The little nautical elements, tying to their hashtag, made us smile- from the light sticks to the sailor hats, you could tell this group was well equipped to party. Overall, it was a well-executed, special, and emotional day. We are so glad we were there to capture it! Thanks to Kristin Mullen from Events by Kristin for ensuring a flawless day. It was a great joy to work with Ben and Chrys from Ben Q. Photography- these two have an incredible eye for style and beautiful photography. An equally big thanks to the rest of our vendors from the day: Tracy Melton Artistry, in10city band, Arlington Hall, Garden Gate Floral, Holy Trinity Catholic Church.